A fairly straightforward definition, as most would agree, for a far more complex word. And no not complicated in structure or in practice, but in individual meaning. For those not artistically inclined in the traditional sense (like yours truly), creativity can be a scary word, a representation of lack of skill to draw or to paint—memories of your old art classes where you sat in the back with your head down. Yet, for those who attended the recent Teaching for Creativity (TFC) Institute at the Columbus Museum of Art, creativity became more than just a word. As most have directly or indirectly experienced, the focus of today’s educational practice relies increasingly on teaching for test scores and data. The TFC Institute (held annually) like most of the work of the Learning Department at CMA, seeks to open people’s eyes and minds to their own individual creative abilities, in this case, with hopes of the educators bringing their new knowledge back to the classroom where creativity can find its way into everyday lessons and learning. The four-day experience exposed the various teachers from across the state of Ohio (and one from West Virginia) to the versatility of creativity across age groups or subject matters. Through speakers, activities and collaboration with fellow attendees, these teachers were able to reflect upon out their own creative practice while making new connections, thinking about problems, and creating their own solutions. Perhaps the most insightful moment of the four-day event came at the very tail end of the TFC Institute. In the final activity, the sixty participating educators imagined their “perfect summer evening” and then re-imagined that same evening as if they were a monster instead. 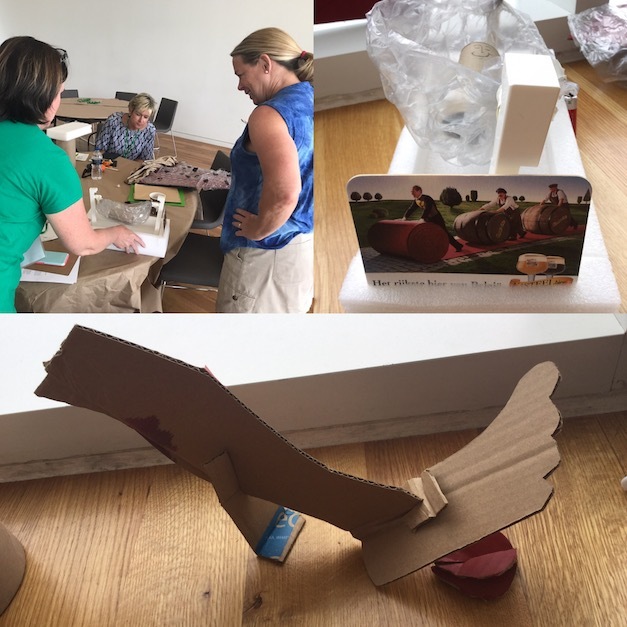 Many educators chose to create a creature out of various pieces of cardboard, Styrofoam, tape, or whatever else they could get their hands on. The final results were as kooky as you’d expect from the mind of a young elementary student, with just a few adult twists and maybe some straighter lines. This activity felt very important in the grand scheme of what the TFC Institute was trying to accomplish. Creativity is not just for the artistically inclined or the occasional art class, but rather a skill to be practiced by everyone no matter their age or profession. To see sixty adults sitting on the floor furiously cutting and taping away is a sight to behold. Not only for the slight absurdity of the situation, but for the enthusiasm and eagerness at the chance to create exhibited by educators who had been at the conference for four days. To stifle creativity in the classroom, or in any environment, does a disservice to the organic originality and imagination that produces so many great ideas in the world. While being exact or following the guidelines has its place and time, impulsiveness can lead to heaps of new ideas and innovations. As students grow older and school become more and more vital to their future, those key problem solving-skills practiced in creative outlets can make learning that much easier. Breaking the norm and expectations of the classroom is easier said than done without a doubt, but with a goal in place to cultivate creativity in the minds of young learners and adults, the first steps are very much in place. – Sam Brady is a senior at The Ohio State University, currently enrolled in the Middle Childhood Educational Studies program. As part of his program, he is completing a 10-credit hour internship with the Columbus Museum of Art’s Learning Department.